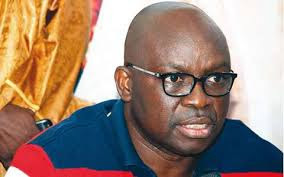 The Ekiti State Governor, Ayodele Fayose, on Sunday fulfilled his promise to reward the recently released Finance Commissioner, Toyin Ojo, and the state Accountant General, Mrs. Yemisi Owolabi, with new cars. The governor handed over the keys to new Kia Rio cars shortly after a thanksgiving service to mark his third anniversary in office at the Government House. The officials were released on Wednesday after spending 14 days in the custody of the Economic and Financial Crimes Commission. They were quizzed for alleged mismanagement of state funds. Alleging that the arrest of the officials was illegal because only the state’s House of Assembly could raise questions about the Ekiti financial status, he added that the state government would sue the EFCC for acting beyond its powers.